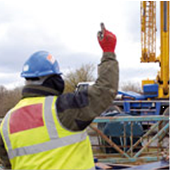 The CPCS A40b Slinger Signaller – Static Duties course aims to provide the candidate with a thorough practical and theory training in operating as a Slinger / Signaller in order to to enable the candidate to pass the CPCS Theory and Practical Tests. All visitors must report to reception on arrival and follow site safety rules at all times. The Construction Plant Competence Scheme (CPCS) is recognised by the UK Contractors Group (UKCG) and Major Home Builders Group (MHBG) as the preferred card to comply with codes of practice for competence and certification. It was launched in 2003 to help them comply with regulations and requirements and aims to apply common standards for all plant operators. CPCS is owned by the Construction Industry Training Board (otherwise known as CITB). These tests can be viewed online by clicking here. Once you have achieved your Red CPCS Trained Operator Card it lasts for 2 years. During these 2 years you must work towards and achieve your NVQ in Plant Operations to upgrade to a Blue CPCS Competence Card.